This little kingfisher is rarely seen but was observed near flowing streams on the Douglas campus in February, 2007. 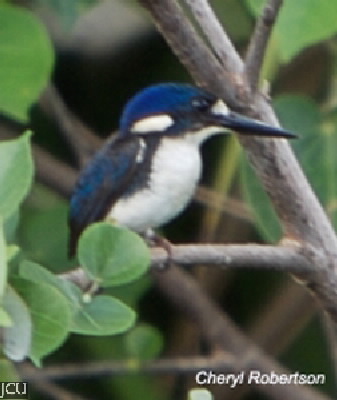 It has a blue upper body and lower parts are white, the short tail is blue. A distinctive white spot is in front of the eye and a small whitish flash is present on the throat. Legs and feet are blackish, eye is dark brown, bill is long, thin and black.